Literally meaning ‘touch your heart’ Dim Sum has always basically been snack food. The custom originated in Chinese tea houses, but while we in the West may like to have a piece of cake with our cup of afternoon tea, dim sum is just as likely to include a fried prawn or a meat dumpling as it is a custard tart. You probably won’t find dim sum on the menu of your local Chinese restaurant; instead you’ll need to seek out a restaurant that specializes in, and only serves, dim sum. Then, like tapas in Spain, you can pick and choose the individual bits that you fancy and make a complete snack food meal of your dim sum. Combine all the filling ingredients. Place spoonfuls on each wonton skin. Damp the edges of the skins. Pull up the edges to make little dumplings (or money-bags). Press the edges to seal. 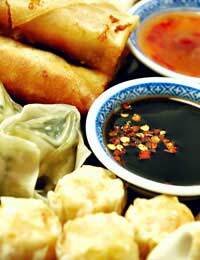 Pour oil into the wok and deep fry the dumplings a few at a time until cooked and golden-brown. Drain well on kitchen towel. Serve hot with a dipping sauce. Mix vegetables, tofu and seasoning for a vegetarian version. Peel the prawns (if necessary) and, using a sharp knife, remove the black spidery veins. When you’ve done that, using the knife again, make a deep cut the length of each prawn along its back. Flatten it out so it looks like a butterfly. Repeat for each prawn.Sprinkle the flattened prawns with sherry. Dip each prawn first in the beaten egg then in the cornflour. Heat enough oil for deep frying in the wok. Fry the prawns, a few at a time, until crisp and golden. Drain on kitchen towel. Serve garnished with coriander leaves with a dipping sauce. Sieve the flour and salt into a large bowl. Make a well in the centre and add the yeast, sugar, oil, water and about half the beaten egg. Using your hands begin to draw it all together. Knead the dough until it comes away from the sides of the bowl. Sprinkle flour on the work surface and continue kneading until the dough is smooth and elastic. Put it back in the bowl and leave, covered with a damp cloth, in a warm place until it has trebled in size. Mix together the stock, oyster sauce, sugar, cornflour, ketchup, soy sauce and pepper. Heat 1 tablespoon oil in a wok. Add the onion and stir fry for about 2 minutes. Add the pork and continue stir frying for another 2 minutes. Add the sherry and the pre-mixed stock and sauces. Cook stirring until the sauce thickens. Mix in the sesame oil. Set aside to cool. When the dough has risen, take it from the bowl and knead lightly. Roll into a cylinder shape and divide into 12 pieces. Work a piece of dough into a ball. (While you’re working on 1 piece, keep the others in the bowl, covered.) You should keep working the dough until, if you press your finger into it, it will spring back. Make a well in the ball of dough. Place about 1 - 1½ tablespoons in the well, and then pinch the dough closed. Place the bun, seal-side down on a greased baking sheet. Repeat with the remaining balls. Place them at least 2” apart on the baking sheet to allow room for them to expand. Leave the buns, covered with a damp cloth, in a warm place to rise for about 1 hour. Pre-heat the oven to 180oC, gas mark 4. Using the remaining beaten egg (with a little added water if necessary), brush the tops of the buns. Bake for 15-20 minutes until golden brown.If you want the buns to remain soft, brush lightly with oil immediately after baking.